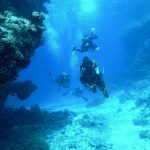 What is the law regarding minimum age limits for scuba diving in Tenerife? We follow the PADI standards, which also comply with Tenerife law, at all times. The youngest age we cater for is 10 years old for Scuba diving courses. ‹ Does your boat have oxygen and first aid kits?